Exterior shot, above, of tasting room at Cline Cellars. Photos from Cline Cellars. are you from?" To which the wine replies, "What's it to ya?" That, in a nutshell, explains two different perspectives about land and region and winemaking. Long story short, before a scenic detour to a couple of vineyards. Many countries with extensive wine traditions (and I mean a millennia of wine production) developed systems of classifying not only the wines, but also the regions that produce them. A good sense of the region can tell much about the wine itself. That’s why any good wine store further sub-classifies the wines of many countries. For instance, French into Bordeaux, Burgundy, Rhône, etc., and Italian into Piedmont, Umbria, Tuscany, etc. Why all this fuss over regions? It’s mostly about dirt.What’s the dirt on wine? Not gossip. The actual real soil. Dirt is a rather complex compound, filled with different mineral qualities and water quantities. The type of soil greatly shapes the character of the wine. After a millennia of wine-making (and enough red wine hangovers to keep country music busy for centuries), the Europeans have their regions down to a science. The Carignane grape is a blending grape that the vineyards at Cine Cellars yield a small quantity of each harvest. By contrast, wine making in the Americas – that is, from Canada to Chile – is relatively new (only a few hundred years old). American winemakers are still finding out what the soil can do, having delightful fun with grape production, experimenting with blending different varietals, and basically seeing by trial and error what works and what doesn’t. Along a rather non-descript country road in Northern California, an Italianate villa – Jacuzzi Family Vineyards – incongruously rises from the flat arid land. Across the street, tucked behind a longish driveway is a farmhouse, converted into something resembling a country store – Cine Cellars – that just happens to sell wine. Looks are deceiving. Like “The Patty Duke Show,” they are related, even closer than cousins. The Cline family owns both vineyards. Cline Cellars is the first vineyard that Frank Cline created. Jacuzzi is the second. Why two vineyards? The original one, Cline, partly specializes in Zinfandels, a grape indigenous to the American West but related to the varietal Primitivo. Jacuzzi, in contrast, specializes in Italian varietals, including Sangiovese, Nebbiolo, Nero d’Avola, and the rare Aleatico. Two vineyards – one small area – producing entirely different types of wines. American viniculture. Ya gotta love it! In this installment, a closer look at Zinfandel. 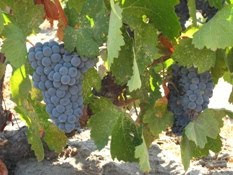 Until about 20 years ago, Zinfandel, often called “Zin” for short, was not considered to be, shall we say, a fine grape. While the wines they produced looked great, bearing a deep plum color, they often very smelled strongly of blackberry (blackberry nose). The first sips often tasted on the sweet side with more of a fruit-juice effect than that of a well-fermented wine (fruit forward, jammy). There were few other flavors to detect (lacked complexity). Zins nevertheless tended to bite back and demand recognition (hearty). A fruity, sweet, hearty wine? Not exactly a good fit for pizza, bad barbecue, or even burgers. Zins got no respect, until expert winemakers tamed the rough edges, tampered the sweetness, and smoothed out the jamminess. Enter vineyards such as Cline Cellars. Cline produces masterful Zinfandels. The basic characteristics of a Zin comes through – the nose and taste of blackberry, the heartiness and a relatively high alcohol content (14 percent) – but instead of swilling spiked blackberry-grape juice, imagine a well-made wine. The beauty of the Cline Zins is their wonderful aftertaste (long lingering finish). Subtle flavors come through (undertones), reminiscent of spices, which seem to take on different characteristics for a full minute after tasting (unfolds, reveals). The combination of heartiness, long lingering finish, and undertones that continually unfold make for engaging wines (good complexity). Cline Zins are designed to go with food: a well-aged cheese, charcoal grilled steaks or roasted lamb. 2008 Bridgefield Zinfandel. A substantial wine, this Zin sports the traditional blackberry undertones, but also carries with it a touch of vanilla and nutmeg. $28. 2008 Big Break Zinfandel. A bear of a wine, add sage and cardamom undertones to the usual blackberry, and stand back. The tannins are soft enough, but the wine’s richness will knock you for a loop. $30. [Bonus: Not a Zin, but a Syrah of note is the 2008 Syrah. Stay tuned: In tomorrow’s installment, the wonders of Jacuzzi’s Italianate wine.